Corona, Calif. (June 22, 2010) Monster Energy/Pro Circuit/Kawasakis Dean Wilson earned his first career AMA overall win as well as his first moto win at Budds Creek in Maryland. The 18-year-old rookie went 4-1 to claim his first victory just two weeks after nearly earning the win at Freestone. Tyla Rattray continued his string of podium finishes going 2-3 to finish third overall. The 250-class points leader Christophe Pourcel was fourth overall going 1-6. Jake Weimer went 21-7 to finish 12th overall. Pourcel once again dominated qualifying as he earned the first gate pick for the fourth straight event. Wilson was fifth fastest, Rattray was ninth quick and Weimer was 11th in qualifying. In the first moto, Pourcel got a good start and led wire-to-wire to claim his fourth moto win of the season. Behind him, Rattray again got a good start crossing the line in fifth with Weimer just back in seventh. Weimer was running well until lap eight when he dropped back to 33rd in the order. He spent the last half of the moto clawing his way back up to 21st. Also moving up was Wilson who moved from 11th to sixth in 10 laps. Rattray rode a steady race slowly working his way into second. In the second moto it was Wilson who got the jump out of the gate, running second for two laps before making a pass for the lead. Wilson went on to lead the last 14 circuits to claim his first moto win, but he wasnt sure if it was enough to clinch the overall. Pourcel, Rattray and Weimer were all running together fifth through seventh early in the race and the trio kept picking off spots. Rattray held the best lines as he worked his way up to third while Pourcel would finish sixth and Weimer seventh. Pourcel, Rattray and Wilson continue to hold down the top three spots in the championship standings, as the team now must prepare for the challenges of Thunder Valley, just outside of Denver. X Games 15 Schedule of Events.. I am so jealous, my son is out in California visiting his sister Erica, and her fiance Paul Perebijnos, AND they are going to the X Games at the end of this week. 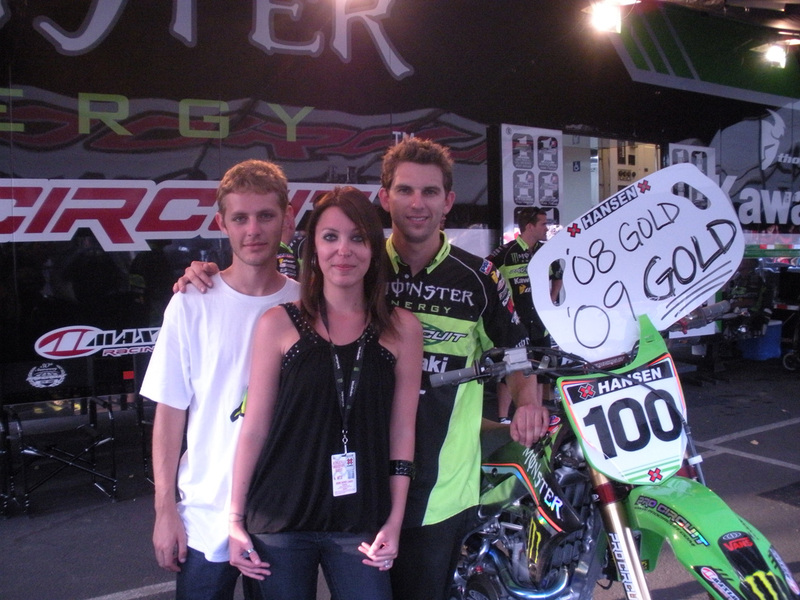 Paul works for the Monster Energy/Pro Circuit/Kawasaki team, and is Ryan Morais’s mechanic. THE LIVE VIDEO FEED IS AWESOME!! CLICK HERE FOR A LINK TO ESPN’S X GAMES LIVE VIDEO FEED. CLICK HERE FOR A LINK TO THE SCHEDULE FOR THE X GAMES! CLICK HERE FOR THE ESPN TV GUIDE – SHOWS THE SCHEDULE FOR THE X GAMES. That is right, my future son-in-law Paul Perebijnos, who I have talked about a few times on here, is featured in the current issue of RacerX on page 196. 5 Minutes with Paul Perebijnos – Graduate/Mechanic!! I for one love the article and it just goes to show you that a good education goes a long way. Check out the article, written by Billy Ursic.